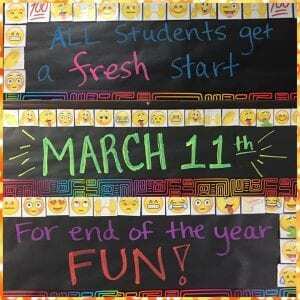 Monday, March 11, the JH started a new incentive for students. All Junior High students got a fresh start/clean slate to earn incentive field trips! To help students earn one of these trips, they will need to meet the criteria listed on each poster (viewable in the JH hallways, on Facebook and with this article). 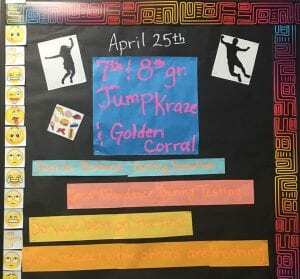 For the Jump Craze trip on April 27, the students need to be present on all of the days we do D-Step Science (eighth only) April 1-3; Smarter Balanced Math on April 8-10; and Smarter Balanced Reading on April 15-17. The students also need to put forth effort and have no behavior issues on the testing days. 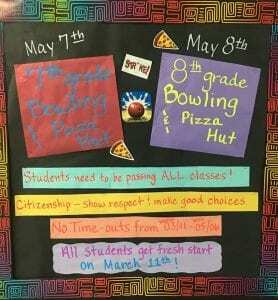 For the class trips on May 7 and 8, students need to be passing all classes, show citizenship by being respectful and making good choices that do not result in behavior consequences. That means NO Time Out/ISS/OSS from March 11 to May 6. 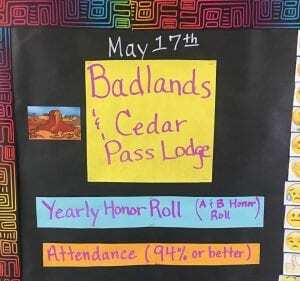 The trip to the Badlands on May 17 will be determined by yearly Honor Roll of 3.0 or higher and Attendance of 94% or better. Students have to meet one of these two criteria, plus no TO/ISS/OSS during the year. Please help students achieve the goal of an incentive trip!